Why consider specializing in the field of Anger Management? There is a growing need for anger treatment and violence prevention in our society. If you are a counselor, pastor, leader, mental health or health professional, educator, law enforcement officer – you work with clients, interface with people, couples, co-workers, even professionals who often mismanage anger. Many courts, employers, institutions, businesses and schools are ordering people to take anger management classes/programs which are hard to find and many are not credentialed. The Anger Management Institute- Trainer certification programs provide the foundation for becoming an Anger Management Specialist. Our programs are endorsed and approved by the National Anger Management Association (NAMA). Participants who successfully complete our live workshops or home-study trainer course are eligible for the following designation by NAMA: Anger Management Specialist-1 or II (membership fee extra). NAMA – a national organization headed by Dr. Rich Pfeiffer – provides oversight in the area of anger management training curriculum and credentials Anger Management Specialists. The current Illinois Anger Management Institute staff approved by NAMA to present and certify trainers are: Glen Cannon, LCPC, CADC, CAMS-IV; Lynette J. Hoy, NCC, LCPC, CAMS-V; Jeffrey Darling, LCSW, CAMS-III; and Steve Yeschek, LCSW, CAMS-IV. Lynette, Glen, Jeffrey & Steve have all been designated as Anger Management Consultants, Supervisors and Diplomates with NAMA. Live Texas Workshops: October 4-5, 2017 at Dallas Baptist University, Plano, TX. Obtain the National Anger Management Association Certification as an Anger Management Specialist I or II at our Oct. 4-5, 2017 Certification Workshops. Includes CEUs, workshops, Training binder, Leader’s guide and assessment tools! (NAMA membership fee not included). Download the registration flyer here! Esteemed Presenters: Dr. Seigel Bartley and Dr. Cook! Provides 12 NBCC CE hours; 12 Texas State Board CEUS and 12 NAADAC CEUs! University student discount available! Live Illinois Workshops: November 9-10, 2017 at Lewis University in Oak Brook, IL. Obtain the National Anger Management Association Certification as an Anger Management Specialist I or II at our November, 2017 Certification Workshops. Includes CEUs, workshops, Training binder, Leader’s guide and assessment tools! (NAMA membership fee not included). Download the registration flyer here! Provides 12 NBCC CE hours, 12 NASW, 13 IAODAPCA, 12 NAADAC CEUs! 1. Certificate of completion of approved NAMA Anger Managment Specialist program (basic content) by the Anger Management Institute. 2. Qualification for the credential (upon submission of NAMA membership and fee) as an: Anger Management Specialist-1 or II. *Home study students need to complete 4 phone training supervision sessions. We provide the certification programs (approved and endorsed by NAMA) which qualify participants for the Anger Management Specialist level one designation. What will acquiring this recognition and status in anger management do for you and your practice? Provides you with credentials and curriculum to specialize in the area of anger management by a leading National Anger Management organization. Contact Lynette at 630.368.1880, ext. 1 for more information on training programs. Complete a live Anger Management Institute training certification workshop/program. These workshops certify leaders, professionals, law enforcement officers, pastors, educators and others to teach anger management to groups, clients and classes. Once certified trainers qualify for Anger Management Specialist-1 or II designation by the National Anger Management Association. Option Two: Enroll in a distance-learning Certification Trainer Programs: Includes over 7 hours of DVD workshop training! Step One: Order and complete an Anger Management Institute distance-learning trainer certification program (Basic or Advanced). *Home-study or online students required to take phone supervision. 4 hours of marketing, business practices, consulting. 2. Adult Trainer-Specialist Course Certifies professionals, facilitators and leaders to skillfully help adults manage anger! This Trainer’s anger management course fulfills Part One requirements of the Advanced 40 hour certificate course. This course is a self-study based on the expanded book and revised Trainer’s manual. Certified Anger Management Trainer credential is awarded upon successful completion of the exam and 2 assignments. 12 hours of adult anger management education and facilitator training; 4 hours of assessment; 4 hours of marketing, business practices, consulting. Step Two: Once the basic distance-learning Trainer Certification program is completed successfully (quizzes) then, order and complete 4 phone (30 min) supervision sessions with the Anger Management Institute. You will find these sessions highly beneficial in discussing application of the curriculum to your clients and students, difficult cases or situations, marketing and starting up anger management programs & specialty. Scheduling will be arranged with Steve Yeschek or Lynette Hoy, NAMA Supervisors. Once this step is finalized – the Anger Management Institute will send verification of your completed certification & supervision to NAMA. You can then complete and send in the NAMA membership application and fee to receive the Anger Management Specialist-1 or II credential! Call Lynette Hoy at 708.341.5438 to order the distance learning Anger Management Trainer’s course or if you have successfully completed one of the Anger Management Institute trainer’s programs – order the supervision sessions now. Make organization checks payable to CounselCare Connection, P.C. and mail to: Lynette J. Hoy, 1200 Harger Rd., Suite 602, Oak Brook, IL 60523. This certification requires a Master’s degree, a professional mental health state license or addictions counselor certification. Certifies individual to provide anger management clinical services including anger management counseling, anger management therapy in accordance with their particular mental health license. Lynette J. Hoy, NCC, LCPC, is a marriage and family counselor, crisis counselor and the co-founder of CounselCare Connection, P.C. She is an anger management specialist, President of the Anger Management Institute and a Domestic Violence Advocate. Lynette has recently been recognized by the National Anger Management Association as a: Diplomate, Anger Management Specialist-IV, Supervisor and Consultant. Mrs. Hoy is a National Certified Counselor, a Board Certified Professional Christian Cournselor, and a Licensed Clinical Professional Counselor in the State of Illinois. She holds a Master’s Degree in Community and Family Counseling from Northeastern Illinois University and a Bachelor of Science degree in Nursing from North Park College. 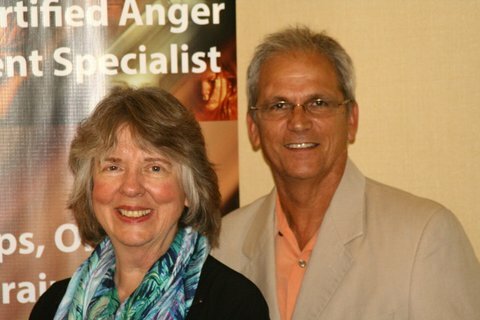 As the founder of the Anger Management Institute, Mrs. Hoy has authored anger management courses for court-ordered individuals and provides trainer certificates for leaders and counselors who desire to teach anger management and lead groups. She is a speaker, writer and seminar presenter for community groups and professional organizations. Steve Yeschek, LCSW is a Licensed Clinical Social Worker and co-founder of CounselCare Connection, P.C. in Oak Brook, Illinois. Steve has been recognized by the National Anger Management Association as a: Diplomate, Anger Management Specialist-IV, Supervisor and Consultant. Mr. Yeschek is an excellent clinician with extensive in-patient and out-patient counseling experience. He is an anger management specialist and consultant with the Anger Management Institute. Steve specializes in counseling individuals with anger, addictions, mood and behavioral disorders and relationship issues. He is an Associate Pastor overseeing the caring ministries and support programs at his church in Crystal Lake, Illinois. Steve has facilitated many groups over the years for various issues especially anger management and teaches skills for anger management coaching. Contact Lynette Hoy at: 630.368.1880, ext. 1. Contact Lynette Hoy for more information if you are interested in becoming a trainer and specialist in anger management at: 630.368.1880, ext. 1.